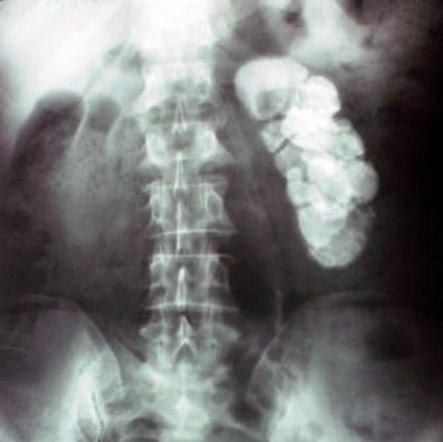 A 56-year-old woman presented with an incidentally detected calcification in the left kidney following ultrasonography, which was performed for the evaluation of right sided upper abdominal pain. Ultrasound also showed multiple gall bladder calculi. Their were no other abnormalities. 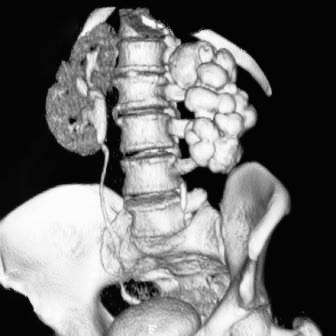 The patient did not report any history of pain over the left flank, or any urinary complaints. The patient was treated for pulmonary tuberculosis at the age of 25. Routine urine microscopic examination and abdominal examination were normal, and there were no enlarged peripheral lymph nodes. Blood urea was 45mg/dL and serum creatinine was 0.9mg/dL. A kidney, ureter, and bladder (KUB) X-ray and computed tomography (CT) urography is shown in Figure 1 and Figure 2, respectively. What should the treatment be? The diagnosis is putty kidney with autonephrectomy secondary to tuberculosis. KUB x-ray (Fig.1) shows calcification of the left kidney. CT urography confirms that the entire substance of the left kidney is replaced by a dense calcification and there is no excretion of contrast from the left kidney (Fig.2). No treatment is required in asymptomatic patients; however, nephrectomy is indicated if there is pain, hypertension alongside a unilateral renal lesion, or recurrent urinary tract infections. Becker JA. Renal tuberculosis. Urol Radiol 1988;10(1):25-30. Leder RA, Low VH. Tuberculosis of the abdomen. Radiol Clin North Am 1995 Jul;33(4):691-705. Kenney PJ. Imaging of chronic renal infections. AJR Am J Roentgenol 1990 Sep;155(3):485-494. Clifford AV, Noon AP, Raw D, Hall J. Renal calcified mass misdiagnosed as a renal calculus in an adult with tuberculosis “autonephrectomy”: a case report. Cases J 2009;2:7613.